Latest News: (23rd Feb 2019) FCI will call applicants from 28th Feb 2019 to make online applications for FCI JE/Assistant Grade II/Steno Grade II/Typist & Assistant Grade III posts recruitment. The department, Food Corporation of India (FCI) has released the Official Notification regarding the FCI Various Post Recruitment 2019. The declared recruitment is for the Junior Engineer (JE), Assistant Grade II (AG-II) (Hindi), Steno Grade-II, Typist(Hindi) & Assistant Grade-III (AG III) posts. The declared recruitment consists of 4103 vacancies. Candidates who want to be part of the FCI department can apply for the same. The application for applying the FCI Various Post Recruitment 2019 will be started on 23 February 2019 and it will be going on till 25 March 2019. All candidates are advised to check the FCI Official Notification 2019 prior to making the Online application. One can check their eligibility by reading the FCI Official Notification 2019. Only eligible candidates are allowed to make the online applications, the rest of the application will be rejected by the authority. So aspirants suggested paying attention while applying for the FCI Various Post Recruitment 2019. Also, they all are advised to apply for FCI Various Post Recruitment 2019 before the last date i.e. 25 March 2019. Also, they all can check information on the FCI Offical website i.e. www.fcinefjobs.com. Also, they can check this on this article as well. How to Apply for FCI Various Post Recruitment 2019? Click the Direct Link above to apply for FCI Recruitment 2019. Fill the application form carefully with all details & Print it. Pay the application fee for further process. Alternatively, you can visit the FCI Official Website. 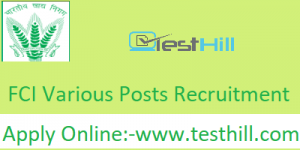 Note: To Know more Details About FCI Various Post Recruitment 2019 must Read Official Notification. The applications for applying for FCI Various Post Recruitment 2019 will start on 23 February 2019. Candidates better hurry to apply for this recruitment as the last date i.e 25 March 2019 is close enough. The authority has advised all the participants to check whether they are eligible or not. FCI Official Notification 2019 is available in the table, you can download it by the end of this post. FCI Various Post Recruitment 2019 vacancies detail is available on this page also. We have updated it all, you can check it just by reading the whole post. Candidates must aware while making the online application. The board is very strict about the documentation as this is one of the most important parts of the FCI Various Post Recruitment 2019. So, pay attention while applying.